Especially when it took you a few hours to get that “no good” mix in the first place. Recently I had a very eye-opening experience, where I did a 30 minute mix of a song and the client much preferred it to my original 3 hour mix. To find out why (and what you can do to avoid my pain) watch the video. I think you should probably always stress to every potential client that, like in Real Estate, it’s rare to find the perfect fit for a client the first time. I agree. I see Graham’s point too, but hind-sight is 20/20. I own a small design business and I would be out of work if I turned down any non-ideal clients. In many cases, the nightmare of a client turns into a lovely person once I find a way to communicate. Granted that doesn’t always happen, but I take it as a challenge to see if I can turn an unsatiable client into a happy one. Plus- the difficult clients also tend to be the ones who are very vocal about their experience. If you can earn their trust, you have done good work, and marketed your business. …and, if by the time you’re done with your project and your “non-ideal” client is very happy, but you’re not….. just exclude it from your portfolio. Simple as that. You could also include, in your initial contract, that you get at least X many chances to “get it right” before they can dump you. That could be a real eye-opener to a client. Actually, sticking to my ideal client is the best thing I could do. I do better work, the clients are happier and better served, etc. I had a client last week where we recorded an acoustic session. The client sang, a friend played cajon, and I played acoustic guitar. The mix was very mono, and I thought it sounded small. So I recorded a double of the acoustic and the panned the two guitars hard left and right. The client asked to hear it with just one guitar, panned only %20 left. He liked it better that way. I was wrong and the client is always right! Awesome! I feel when I”m gonna follow your advice on time frame and going on instinct, I”m gonna simplify tons of worries, tiptoeing, and unhappiness. I’m new here – started recording & mixing about 1 year ago. Last week I had singer snd keybosrd player in my studio who are both new to recoding. We got 6 tracks by the end of the night (3 hours roughly) and it sounded a bit messy! But they were pleased they’d got that much done so quickly. I spent 1 hour a few nights later on the tracks (using very simple software) and only changed pan, reverb, eg and faders. They were really pleased with the outcome. From their perspective I had made a major leap forward in making “music” from six tracks of “sound”. 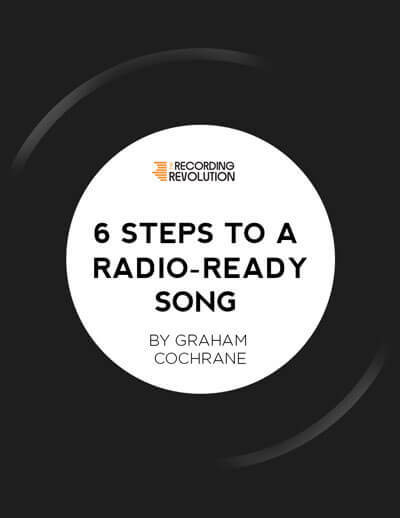 It fellt good to move so far so quickly – I’m sure that experience supports Graham’s point here that you can literally over engineer things (just because you can) and keeping it simple might be all it needs on some occasions. I had the exact same experience with a client(s) where I actually spent hours redesigning “my clients” track idea and layout. How wrong I was, I’ve realised now to hold back and allow “clients expression” to be first and foremost from now on, and as you say, just enhance the track enough to let it shine more. Thanks for your invaluable videos and tuition. Great case study, thnx for sharing. I completely disagree. You should never “take everyone” – You’re not right for everyone. It’s just not a smart way to work. Amen. This seems to happen all the time. Graham,you/we/they are mixing at least two things… the technical and the artistic. The technical side is more cold or warm or wrong or right but the artistic side is the way the artist “sees” the music and if the song belongs to the artist we must try our best to accommodate. But there is no way of knowing for sure what’s in the mind and heart of the artist so we kind of mix with “blind ears” to a point. Everything you did was spot on but the artist heard it and said it isn’t quite what I envisioned so you helped out and it worked in the end. I think one can assume the possibility of having one or one hundred clients with the same artistic attitude but it usually works its way out. Art isn’t always easy but it is very personal to most. Finally, sound (music) plays tricks with our hearts and minds because two people can have two totally different and opposite opinions of a song. Any studio mixing person who is worth his or her weight need to get past the possible negative comments of clients and do what you did and listen to the client and do your best… and if your best is 30 minutes instead of 3 hours that can only be a plus. Keep up the good work Graham. I learned a technique in software development, back in the late 80’s/early 90’s, to test that you’re on the right track early & often, and to “whiteboard” & present that to your client on what you think you’re hearing them say. This goes beyond agreeing over email, etc. ; present a very early “picture/snapshot” & ask, “So, is *THIS* what I heard you tell me to do?”. In audio, this means a quick, 30 minute mix job – pitched & presented as just that, an “early snapshot” of where you’re going to take their music. After all, it’s *their* music, not yours. I never go “full bore” on anything until I get confirmation from the “client” that I’m heading in the right direction. On my most recent project, some of my ideas/suggestions for enhancing their music has immediately been met w/”No, I don’t like that”, only to have them turn around & later say, “Actually, you know what, that *did* sound good!”. This is a creative process; everybody’s involved, and things are often “subjective”. I’m lucky to work only with clients who are personal friends of mine. I hope to eventually do something that involves someone I’m not close with and get equally good results, but I’ve found myself, even for a client of this status, going back and mixing a song a second or third time can get a different, usually better mix. If you’re not really feeling the vibe of the song at a particular time, and not giving the most accurate mix as a result, sometimes it can help to start again from scratch with your initial impressions and approach everything with fresh ears and mind. I’m currently working an independent job as an intern for clients involving video editing and I realize that the same concepts apply. Discussing with them what they like/dislike (in this case, it was mostly stretching photos or videos non-uniformly in order to fill void space; this can equate to over-processing/tuning/quantizing in the audio world) and it has been really helpful as I’ve gone back and adjusted things according to the client’s tastes and impressions and gotten a better result, though it is incredibly debilitating at first to hear that they didn’t like the good majority of what you spent hours working on. Thanks for your lessons. I learned this experience in the hard way. I am beginning to mix and work with DAW. I am in a course for beguinners and one of the exercises was mixing some stuff. I did a mix thinking in the “baroque mode” (lot of everything). I get a a 4 (i live in Spain and the grades go from 1 to 10″). I spent more than 8 hours to do the mix. I did it again from the beguining and do a “rapid basic mix” (the kind of mix that you talked in an older post). “Sounds great”, said my teacher. Now i know what my “teacher-client” wants. Take someone who is starting to paint with oils: if you rush, you’re make a horrible mess. Though time limit forces you to use your best skills, it will not get you anywhere if you’re just honing those skills. I tried this approach on a Dueling Mixes song and felt 30 minutes is not enough for me to even sift through my head and remember where my stock EQ’s are. This is not helpful if you’re just learning your way around your DAW and glancing at your notes from the REthink Mixing videos every 10 seconds. You have to go through the entire process of 1) gain staging; 2) balance/panning; 3) sweetening; 4) automation; and 5) premastering….. all in just 30 minutes….. id does require some skill level, and I’m not there yet. Thanks for being a DM member r.v. ! If you are mixing for the VERY FIRST few times then, no it would be hard to complete a mix in 30 minutes. But I still recommend everyone do the 10 minute mix with just faders and pan pots to get this point across. The problem is, most mixers get familiar with the process and then take WAY TOO LONG mixing when they aren’t really getting anywhere. Just tweaking virtual knobs. I’ve been following your tips and advice for quite a while and not only do I find this really helpful and informative, I also can see that you are a genuine, upfront, honest guy. Very refreshing! Keep up the great work Graham it is much appreciated. I have had over 30 years of dealing with international clients (automation not recording) and I know while there are many good clients out there, there are also enough who appear to have the knack of being awkward and difficult. You deal with these problems in a very professional way! Looking forward to your next tips. Alright I just made a pretty sweet 30 minute mix of a song I’ve been working on. Alright I lied I made some final touches for a few minutes after the timer was off but still, it’s sounding pretty great. Thanks Graham! maybe mixing for 4 hours and then wiping the slate clean is the key? getting to know the song and the sounds for 4 hours can’t hurt before doing the 30 minute power mix. Love the videos especially the Top Down and 30 minute. Recently I did a mix for a client and I admit that I had just purchased a few new plugins, (Waves Reel ADT and Kramer Tape) and wanted to learn and incorporate them into what should have been a simple mix. After spending hours, the client and I both agreed that the finished mix lacked “punch”. I went back, focused on the mix and used only the necessary plugins. The remix took between 30 to 60 minutes and the client and I were both pleased. This was by far the biggest tip for me. I seem to take to much time mixing and trying to get things perfect. Go with your gut! THX you Graham for you giving me a new perspective about mixing! helped me alot!! Great video, Graham! Makes me think it’s smart to send a fast (but solid) mix to clients first, before going full-in and spending more time on it.